Apple on Thursday launched an updated version of its iTunes Connect developer Web portal, with a design overhaul coming alongside deeper data management features for launching, selling and managing content on the iTunes Store. The new online portal carries over the same app management assets familiar to developers, while polishing the overall presentation and updating a number of tools important for tracking user engagement. Apple first demoed the new iTunes Connect at WWDC in June. 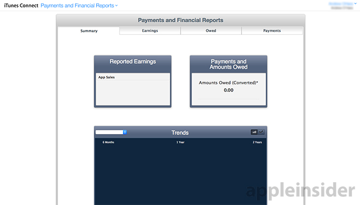 As noted by Apple, the latest iTunes Connect version comes with an updated My Apps section for basic app management, a new Resources and Help pane for solving payments and distribution issues and tweaks to the Users and Roles area dedicated to managing Sandbox test users. As seen in the screenshots, Apple completely revamped the website's design to bring the dev portal more in line with the iOS-inspired iCloud Web client that rolled out last year. Aside from "flat" iconography, the user interface has been tweaked with cleaner drop-down menus and graphical assets. 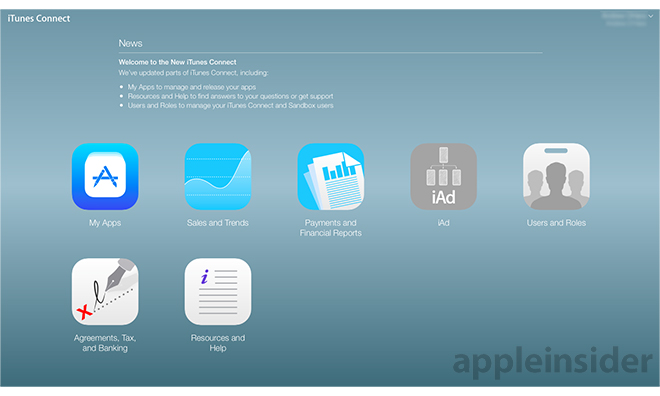 The new iTunes Connect portal brings the Web interface up to speed with the iOS app version released in May. The mobile iteration also sports a design based on iOS 7 and includes basic access to critical app management tools. Developers with proper credentials can access the new iTunes Connect portal now.